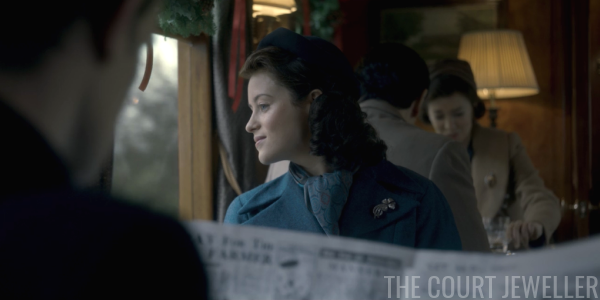 I know many of us have been waiting on tenterhooks for the debut of Netflix's The Crown, a fictional retelling of the early years of the reign of Queen Elizabeth II. Today, we're discussing the jewels and the drama of episode one of the series, "Wolferton Splash." Feel free to chat in the comments below, but please restrict yourself to the first episode -- no spoilers (non-historical ones, that is) for those who haven't seen subsequent episodes. 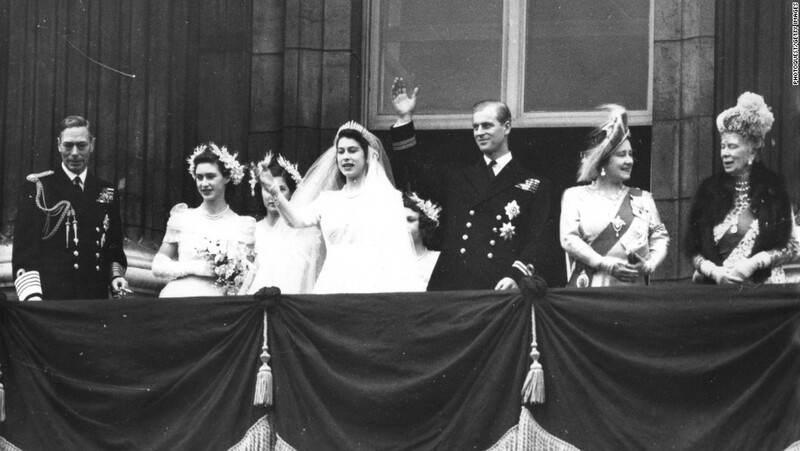 We begin in Buckingham Palace in 1947. 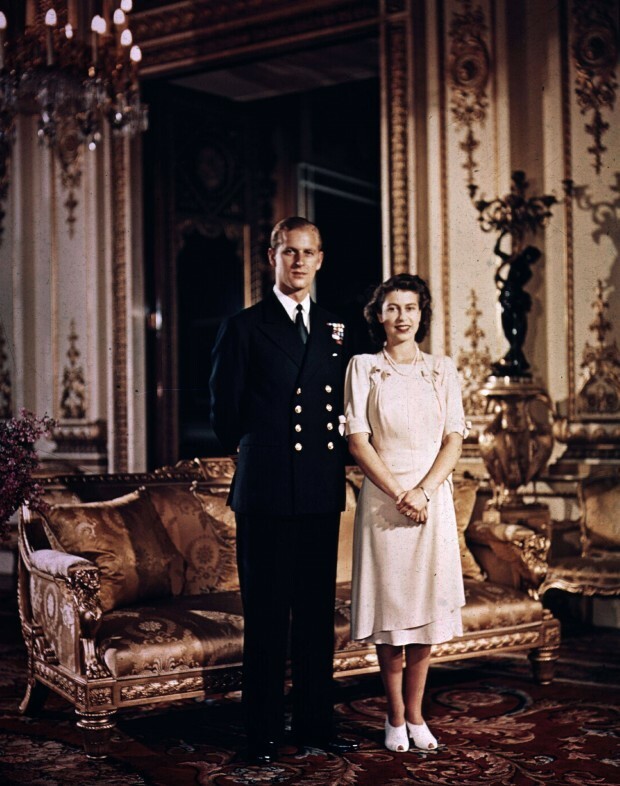 King George VI is ill, and Princess Elizabeth is just about to marry Prince Philip of Greece and Denmark, a naval officer with one too many German connections for everyone to feel particularly good about the match. 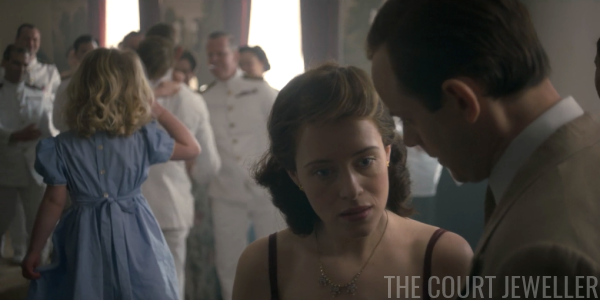 If you're a veteran of royal films, you'll recognize Claire Foy, the actress who plays Elizabeth, from her role as Anne Boleyn in the recent adaptation of Wolf Hall. 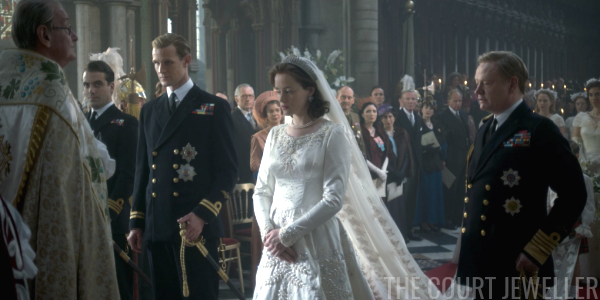 But he's not Prince Philip of Greece and Denmark for long: he renounces his titles, becomes Lieutenant Philip Mountbatten, and is immediately given the Edinburgh dukedom by his soon-to-be father-in-law. 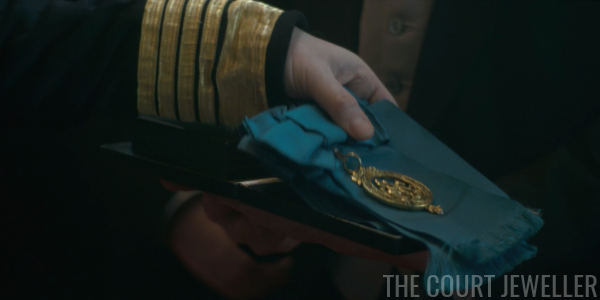 He also gets a bit of new jewelry of his own, in the form of the insignia of the Order of the Garter. Here's a look at the production's version of the Garter sash and badge. Philip, played by Matt Smith of Doctor Who fame, mostly just wants a cigarette. (He famously gave up smoking in real life when he married Elizabeth.) 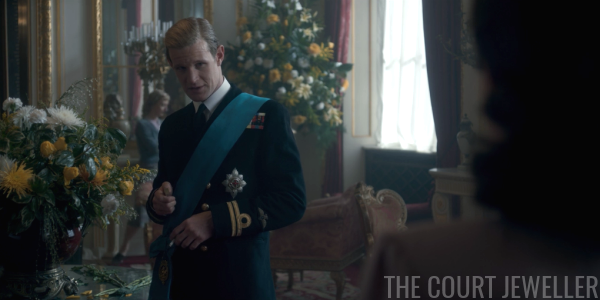 The Garter sash looks a little weird here, but it's because it was draped over his medals when he received it. The two of them banter a little about whether or not he can still back out of the wedding, and then they make out a little. Elizabeth is adorably embarrassed by the whole thing. 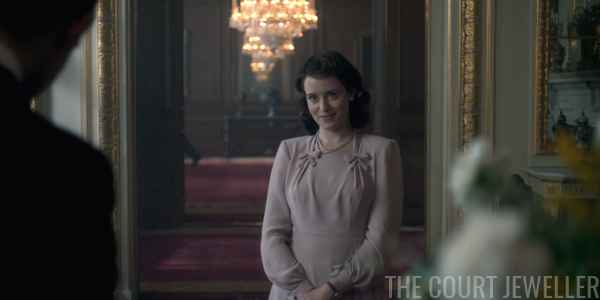 The costume designers have chosen to replicate one of the Queen's real ensembles for this scene: the dress and jewels that she wore for some of her engagement photos at Buckingham Palace. Note the distinctive bows at the neck of the dress. Next up: the royal wedding. 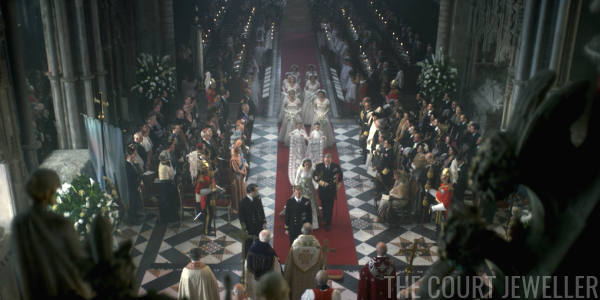 We get some overhead shots of Westminster Abbey that resemble the camera angles from the real-life wedding of the Duke and Duchess of Cambridge, down to the positioning of the bride and groom. Time for my first (but not last!) historical nitpick: the Cosmati pavement, the mosaic floor of the Abbey, was covered with a carpet during this wedding. 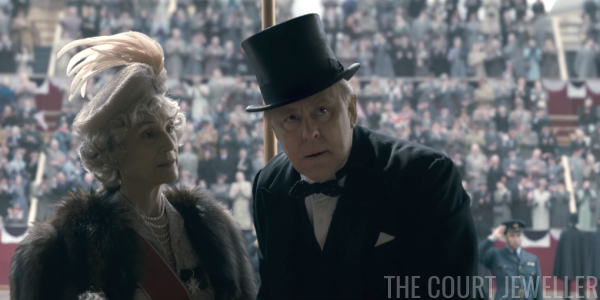 Guests at the wedding include Winston and Clementine Churchill, played by John Lithgow and Dame Harriet Walter. 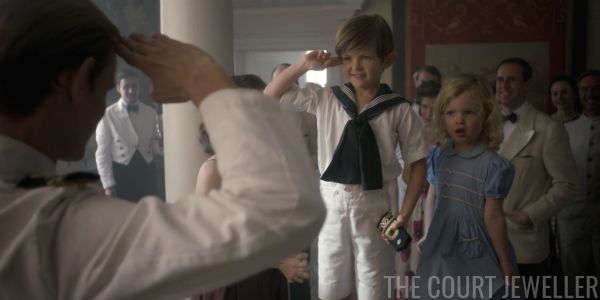 (Again, if you're a royal film vet, you'll recognize Walter as Queen Adelaide in The Young Victoria.) Winston is hoping to reclaim the role of prime minister, and he basically uses their entrance at the wedding as a campaign appearance. Curious to hear what you all think of Lithgow's casting -- I don't mind when actors don't perfectly resemble the real-life figures they play, but I'm having trouble seeing Lithgow as the famous PM. 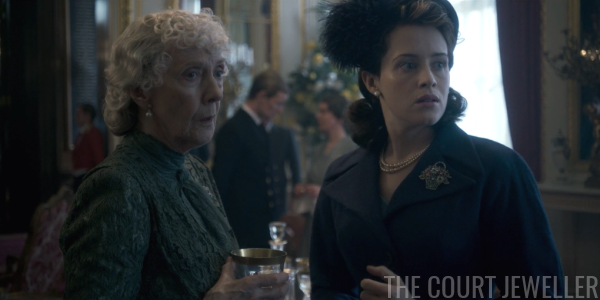 Production was fairly careful about reproducing the outfits worn by the Queen Mother (Victoria Hamilton, who played Queen Victoria in Victoria and Albert) and Queen Mary (Dame Eileen Atkins, who also played Queen Mary in Bertie and Elizabeth). Here's a look at the two real-life women on the balcony after the wedding. (And for fun, here's a very HQ version of the group photo.) The Queen Mum wears Queen Alexandra's Wedding Necklace and Queen Victoria's Diamond Jubilee Brooch. 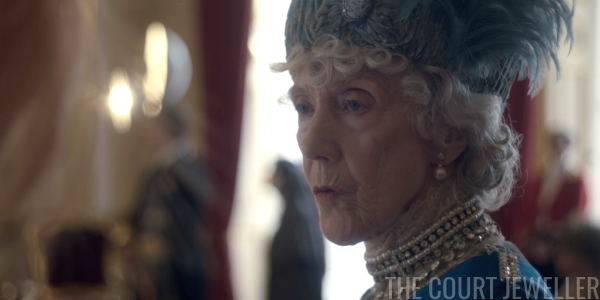 Queen Mary wears diamonds and pearls, most notably the Cullinan III and IV Brooch. Both wore the Garter on their left arms. Here's a closer look at the earrings chosen by the design team for the Queen Mum at the wedding. 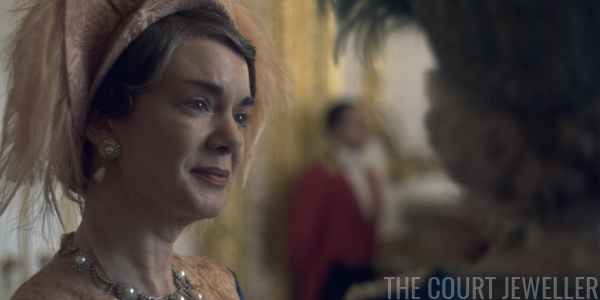 The production's version of the earrings echo the pearl elements of the necklace -- but the earrings that coordinate with Queen Alexandra's necklace are simple buttons without drops (and were still owned by Queen Mary in 1947). On the wedding day, I believe the Queen Mother actually wore the Coronation Earrings. And here's a better look at Queen Mary's diamonds and pearls. 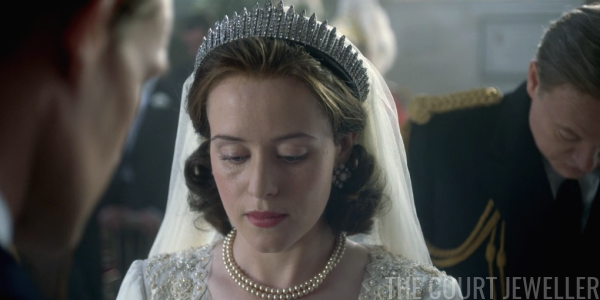 The series was also extremely attentive to detail with Princess Elizabeth's wedding jewels, attempting to faithfully reproduce Queen Mary's Fringe Tiara, the Duchess of Gloucester's Diamond and Pearl Earrings, and the Queen Anne and Queen Caroline Pearl Necklaces. (I have a whole post on the real jewels from the day -- head over here!) 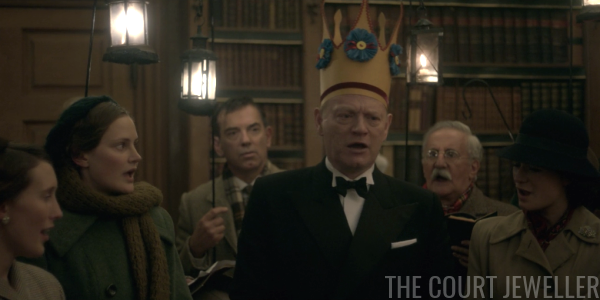 Also: that's Jared Harris on the right as King George VI. Among his many famous roles, he played King Henry VIII in the television adaptation of The Other Boleyn Girl. The series, though, is working to present a narrative of "Philip as outsider," and putting Alice in the habit here is a visual shorthand for that. 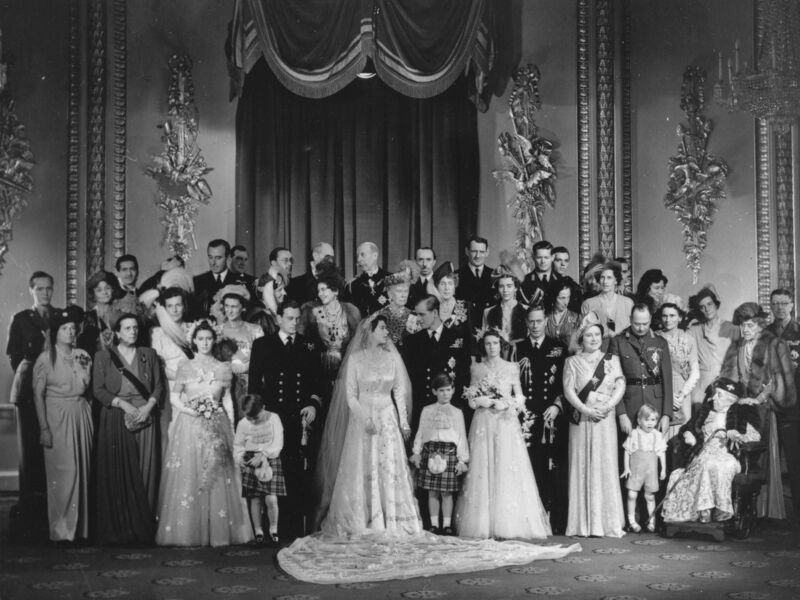 (The Queen Mum also sneeringly calls Alice "the hun nun" during the wedding photo session.) 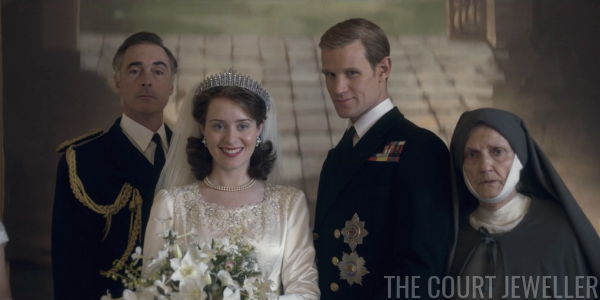 The other person in this photo: Lord Mountbatten, played by Greg Wise (AKA Mr. Emma Thompson). Several other family members, including Philip's aunt (the Queen of Sweden! ), were at the wedding but not depicted here, probably to simplify the storyline. I don't love the "outsider narrative" for Philip for a million reasons, but we'll see. The show skips ahead several years in time, and we find Philip and Elizabeth living in Malta. 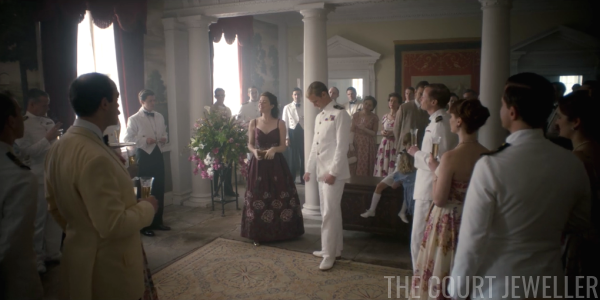 This scene, which takes place at Lord Mountbatten's Maltese villa, shows Philip's promotion to lieutenant commander, which happened in real life in July 1950. Elizabeth wears a necklace, bracelet, and earrings with her casual, Mediterranean-inspired party dress. I don't think these are meant to be replicas of real pieces, just small, period-appropriate jewelry that might have been worn at a party in a more casual setting. 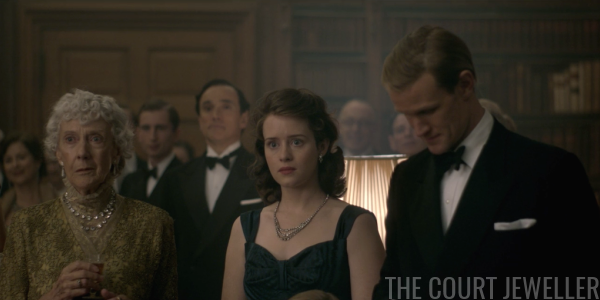 But the timeline's a bit screwy here, because Prince Charles and Princess Anne are both present, and Anne wasn't born until August 1950; instead, this scene has been moved forward to 1951 (and even then, Anne looks a little older than she would have been). Having both of the kids present is another narrative choice; along with the "Philip as outsider" storyline, the show is also developing a conflict between Elizabeth and Philip over their parenting choices, with Elizabeth depicted as being more detached and focused on duty, and Philip as a more hands-on parent. Back in London, the king is in surgery. (In real life, this happened in September 1951.) Nobody in the family, even the king himself, realizes that he has cancer, but surgeons remove his lung in a makeshift operating room in the palace. 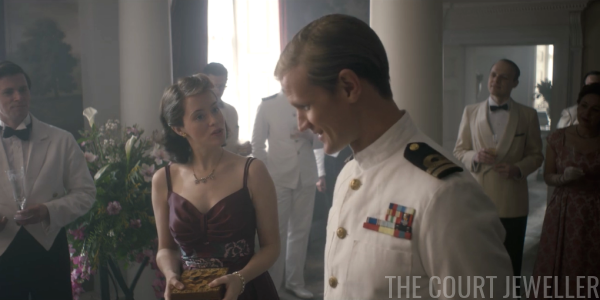 For this tense scene, the production chose to put Elizabeth in a real-life piece of jewelry, and an important one, at that. It's the Flower Basket Brooch, given to Elizabeth by her parents in 1948 after the birth of Prince Charles. 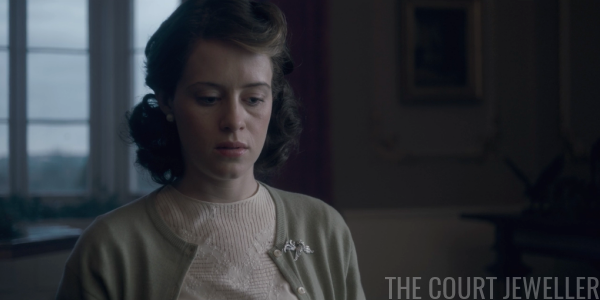 It makes sense that Princess Elizabeth would choose a sentimental piece of jewelry from her parents for this particular moment, especially as the episode underscores the relationship between Elizabeth and her father. The show also demonstrates the similarities between Elizabeth and her grandmother, often placing them together in frame. 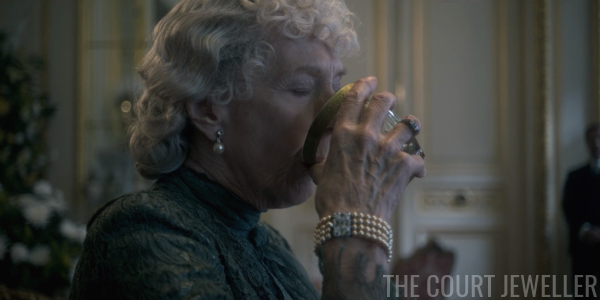 Mary, who has been a witness to the ups and downs of monarchy since the days of Queen Victoria, is depicted as a woman with a keen understanding of power -- something her granddaughter is just coming to grips with. But she's also a mother, and she needs a stiff drink when her son is in surgery. The moment gives us a good look at her pearls, too. The king survives his surgery, and everyone is relieved. Two things of note here. First, Mary's brooch, which isn't a replica of a particular piece, but seems to be inspired by Mary's real-life jewelry aesthetic. And second: look at the positioning of the women here. Queen Mary and Princess Elizabeth are placed on either side of the frame, both standing strongly and firmly as they're given the news. 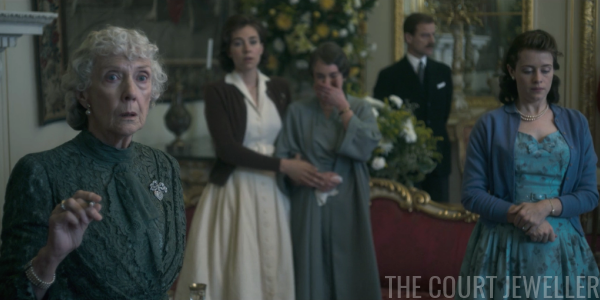 Princess Margaret and the Queen Mother, both presented in this series so far as more emotionally vulnerable, are together in the middle, fading into the background. Strength is clearly the priority. 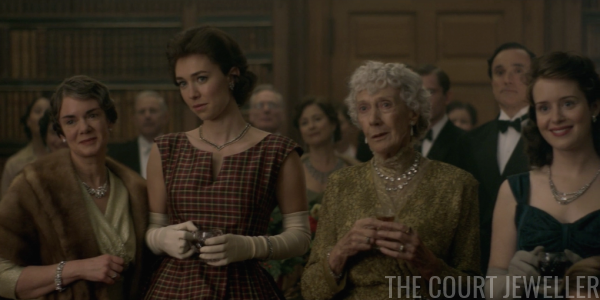 Speaking of Princess Margaret, here's a look at the pearls she wears in one of the following scenes. 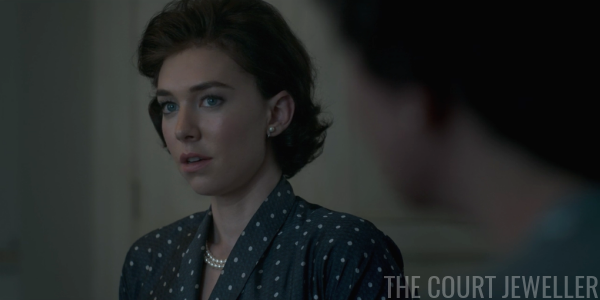 (She's played by Vanessa Kirby, whose previous royal role was as Queen Isabella in a production of Marlowe's Edward II.) 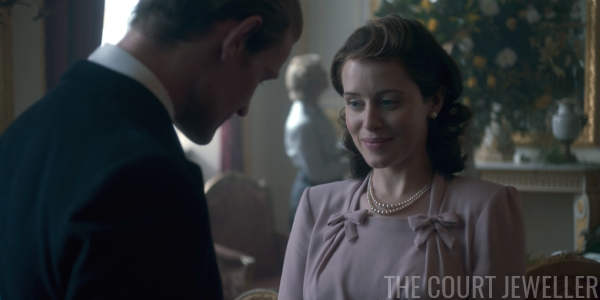 She wears a double-stranded pearl necklace and pearl earrings (clip-ons, it appears) at the lunch, where Princess Elizabeth realizes that her sister is in love with the king's married equerry, Peter Townsend. Oops! 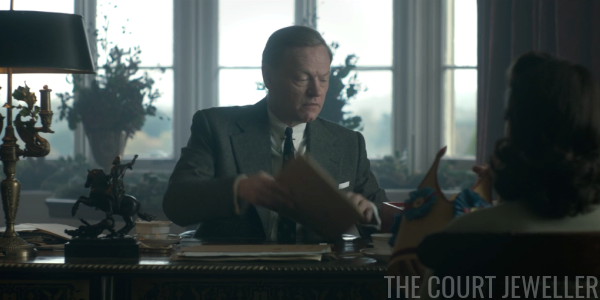 By the time the family travels to Sandringham for Christmas, Churchill has returned as prime minister, and the king has been told that he has cancer. But the rest of the family is (so far) blissfully unaware. Princess Elizabeth wears another "inspired by" diamond brooch, rather than a familiar reproduction from her real-life collection. In the background, Princess Margaret is also wearing a brooch, but it's not clear enough to scrutinize properly. 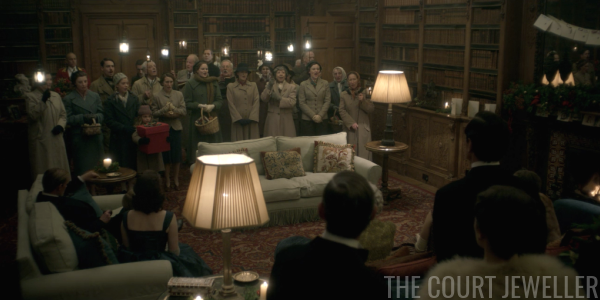 But everything starts to unravel a bit when a group of local villagers stop by Sandringham House to sing a Christmas carol for the royal family. The song they're singing is Rossetti's "In the Bleak Midwinter," which depicts Christ arriving in the midst of a hard, frozen, lowly world. It also includes a lengthy meditation on what gifts are appropriate to give to the Messiah. The littlest caroler steps forward to offer the king a gift: a paper crown, which he finds amusing and immediately puts on. 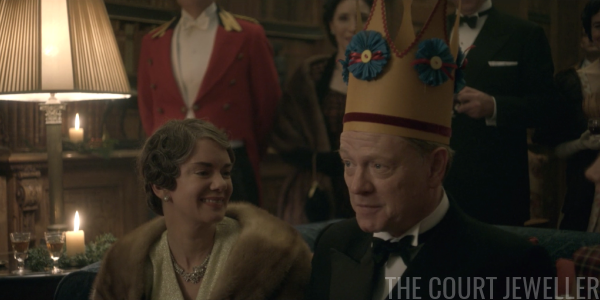 It's worth noting that this is the only actual crown depicted in the first episode of The Crown -- so pay attention to it. The women of the family are charmed by the gift, and by the king's decision to join the carolers to sing the end of the song. Although it's evening -- and Queen Mary famously wore a tiara to dinner every night -- the ladies are wearing more casual evening clothes and jewels. 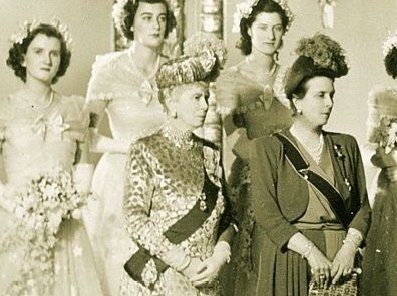 Most of these don't appear to be exact reproduction attempts, although the necklace worn by Princess Elizabeth slightly resembles her real-life diamond festoon necklace -- which was, appropriately, given to her by her father. The king finishes the song, wearing his paper crown, singing aloud the verse where he wonders what presents he, an unremarkable person, could possibly give that would be worthy of Christ. It's all very King Lear -- the king who once reigned over a victorious Britain, humbling himself while wearing a child's facsimile of the greatest symbol of his power. And then, even more Lear-like, the king who has just learned that he is dying begins to cry. 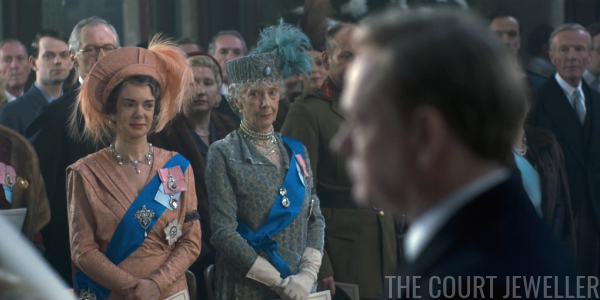 And Queen Mary and Princess Elizabeth, two women who are sharply attuned to presentations of power and strength, immediately understand that something is very, very wrong. Later, the king asks Elizabeth to come to his study. 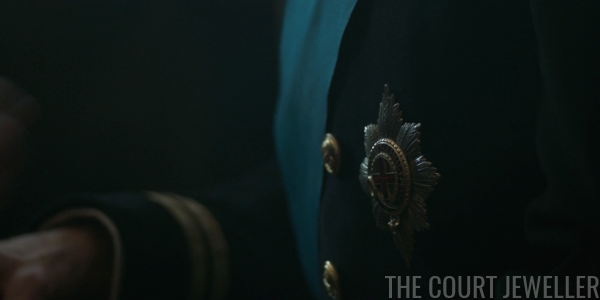 The paper crown is sitting on his desk, and Elizabeth picks it up and turns it over in her hands for a moment before setting it atop another important symbol of royal power: the red box. The pair converse a bit about what it's like to be monarch, how to do the paperwork, etc. Bertie is clearly signaling to Elizabeth that she needs to be aware that she will be monarch sooner rather than later. He also asks her to take his place on the upcoming Commonwealth tour. She worries that she's not ready (although in real life, she and Prince Philip had just returned from a month-long tour of Canada). 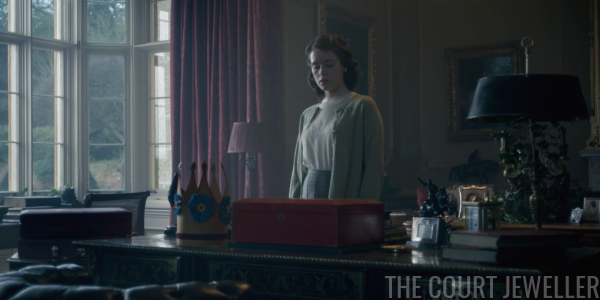 At the end of the episode, while Philip and the king are off hunting ducks, Elizabeth returns alone to the king's study. 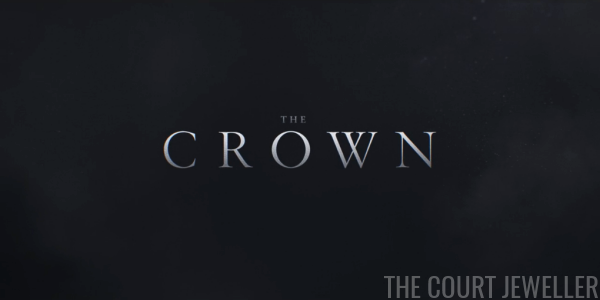 The flimsy paper crown -- the one given to the king directly by one of his subjects -- sits beside the imposing red box, filled with papers related to his government. 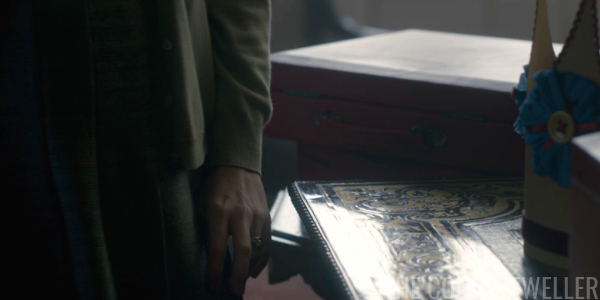 Elizabeth slowly walks around the desk, and the framing of the scene gives us a moment when the crown and the box (two symbols of her role as monarch) are shown beside her engagement and wedding rings (two symbols of her role as wife) -- clear foreshadowing of the tensions that will continue to develop over the course of the series. So, what did you think of the drama and the jewels of episode one? Remember, no spoilers for future episodes. And stay tuned next Monday for a look at episode two!